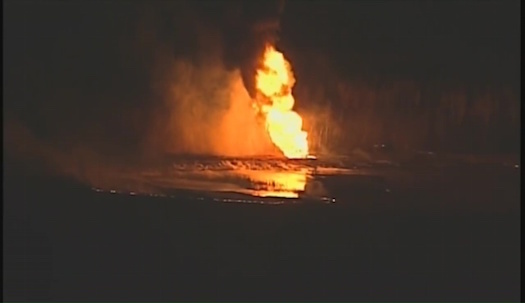 Flames from a pipeline explosion Tuesday night near Kansas City, MO. There were no injuries as a result of a blaze that erupted when a gas pipeline ruptured north of Kansas City, Missouri Tuesday night, officials said. The fire ended up reported about 6:30 p.m. Tuesday in Platte County, north of Kansas City and not far from Kansas City International Airport, a Platte County Sheriff’s Department dispatcher said. The responding Southern Platte Fire District said the blaze resulted from a pipeline explosion, though the cause was unclear. The identity of the owner or operator of the pipeline was not immediately available. The pipeline carries ethane and propane, Kansas City Fire Department officials said. Joe McBride, a spokesman for the airport, said the blaze was not affecting flights at the airport and was not on airport property.